I’ve just discovered a fascinating booklet written by Nicky Ingram of English Heritage, who clearly has a lot of experience in putting on events in historic properties. 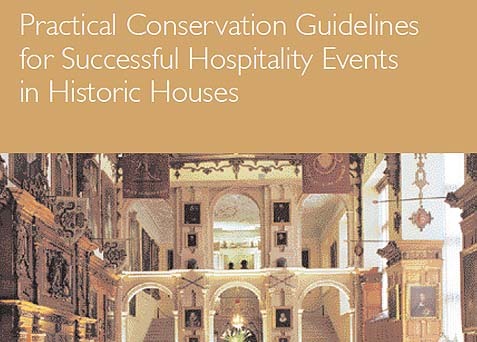 Practical Conservation Guidelines for Successful Hospitality Events in Historic Houses offers 12 pages of sensible ideas in checklist format, from arranging access through your building to protection ideas: it may seem obvious not to allow red wine, for fear of staining, but it’s also worth banning loose berries and soft fruit from the canape menu. Other ideas are practical for any venue with flower arrangements, such as the suggestion that when dealing with lilies or other flowers with staining pollen, you should simply remove their stamens off-site. You can download the booklet for free from this page on Collections Link. Are there any resources you’d recommend for other people keen to stage an evening event in their venues? Do share any links on the comments! My parents came to visit recently, and as they have a car, we were able to explore more remote places of interest: over the last few days we’ve visited Charleston (the country retreat of the Bloomsbury Group), Berwick Church, Lewes Castle, the Anne of Cleves House, and numerous other picturesque little villages including Alfriston. At the start of their visit, we only knew about Charleston and Lewes Castle – so how did we end up discovering so many other interesting places? Through the power of cross-promotion. This flyer, Next Stop Alfriston, was on the tables in the Charleston cafe. 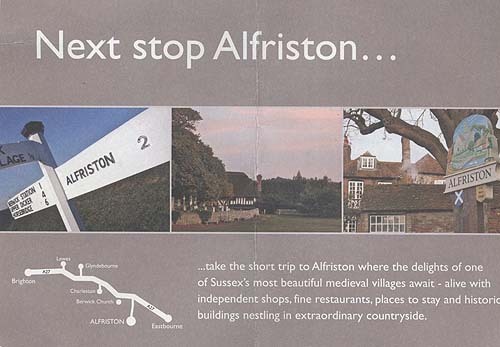 They’ve used a very simple diagram to show nearby places of historic interest, along with an attractive photo on the front, while on the back of the flyer they sold advertising space to businesses from Alfriston. If you’re a more remote rural attraction, it wouldn’t be difficult to produce a series of these flyers, highlighting to tourists that there’s a lot to see in your area, while selling the space on the back to cover your costs. On a tour around Charleston, where every surface is covered in murals or tapestries, the guide made sure to tell us about Berwick Church, which Vanessa Bell and Duncan Grant had been commissioned to decorate, despite not being religious themselves. We made a detour to visit the church, then returned later on for a concert, following which we ate dinner in the village pub. We’d never have spent money in the local economy of this tiny village were it not for the enthusiastic encouragement we got at Charleston – and now I’m recommending the experience to even more people. At Lewes Castle, we were told about discounted entry to Anne of Cleves’ House while they were having building work done, so we called in there as well. We were also delighted with the free tourist map of the town of Lewes, which was cheerfully coloured and had line drawings of all the places of tourist interest. This was given to all visitors for free, and was again paid for by selling advertising space around the outside of the map. Does your town, city or village offer maps like this, and have you noticed the benefits of being included? You can track the numbers of visitors who active using the maps by running a discount offer on the map for people who come to your venue. If you have any other successful strategies for drawing tourists in to your venue, please share them in the comments! Here’s another series of Museums at Night video vox pops: visitors to the Hovercraft Museum explain how they heard about the event, what they think of it, and what they’d like to see in future. Thanks very much for the feedback: it’s good to know that our videos are useful for venue staff and volunteers! I’m interested in all kinds of marketing and promotional ideas that might be useful for museums, galleries and heritage sites. I recently came across this post from the Producer’s Perspective blog, written by Broadway producer Ken Davenport about drawing in and keeping visitors at theatres, and thought that these excellent ideas could be useful for all kinds of cultural and heritage venues. Thanks, Ken, for allowing me to reproduce it here! If you run a theatre anywhere in the world, your goal should not only be to get your audience to your theatre, it should also be to keep your audience at your theatre. The longer they hang around, the more they think of it as a place of respite and entertainment, and the many more tickets they will purchase. Expand the brand and they will buy. While a theatre or a theatre complex will never have the traffic of the Mall of America, there are a number of very small and inexpensive perks that a theater can provide to keep consumers coming back, and maybe, sticking around. Here are Four Ways To Keep Your Audiences At Your Theatre. With more and more devices that need Wifi (like the iPad) for their full functionality, a free Wifi spot is like an oasis in the desert. I’ll plop myself for hours in a comfortable spot just to have that access, and I’m sure your audience will, too. Add Free Wifi to all your common areas, and put signs for it everywhere. You’ll have people stopping by sooner than you think (there’s no coincidence that Starbucks just traded out their pay Wifi service for free service for all). Once your WiFi-ers are online, make them sign up for your mailing list in order to access the web. People love live music and it doesn’t take much to get an up-and-coming singer/songwriter to play a few tunes in your lobby or wherever people may congregate. Or better . 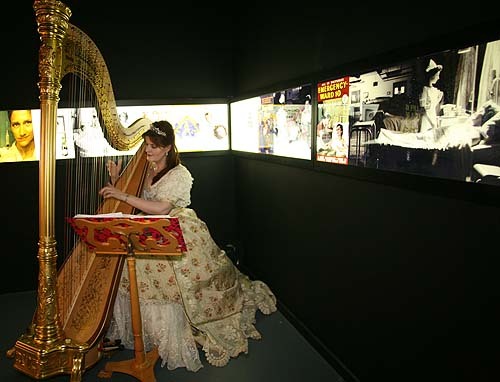 . . use your theatre itself (which is probably dark during the day) for free lunchtime concerts for local artists. I know a bunch of folks who’d do it for tips or for the credit (it’s the coffee house or subway tunnel approach). Speaking of coffee, do you offer free coffee at non-peak times? I’m not saying you have to have the best Columbian beans brewing for every passerby, but some basic free coffee is an incredible pull. There is a Cub Scout group on I-95 that uses this bait and catches a lot of fish. They put a huge “STAY AWAKE! FREE COFFEE AT NEXT REST STOP!” sign on the highway, and get thousands of people pulling over. They do have free coffee . . . and a bunch of other bake sale items for sale. I bought a rice krispie treat. And I don’t even drink coffee. Beyond coffee, strike a deal with a local deli or sandwich shop to get a few sandwiches on consignment. How many times have you gone to the mall just for the food court, and ended up buying something while you’re there? We need food and drink in order to survive. Unfortunately, the same isn’t true for theatre. So, put what we need in your place, and you’ll get more people coming by. People love to learn. This is especially true of theatre audiences (according to League statistics, 73% of the Broadway audience has college degrees, and 36% has graduate degrees). So get some people to give free talks and lectures about a variety of subjects. Have a Broadway producer come and chat about what it’s like to produce on Broadway (I’d do it). Have a local painter come and talk about how she gets her inspiration for her paintings. Or have an investment banker come and talk about how to navigate the choppy market (the subjects don’t have to be about the arts – they just have to be about the audience). By providing these free mini continuing-ed courses, you’ll be giving something of great value to your audience, which should engender a reciprocal give-back to you, in the form of a ticket purchase or a donation. Audiences are like children. You want them playing in your own backyard so you can keep an eye on them, make sure they aren’t being influenced by others, and . . . tell them what to do. How do you keep your audiences at your theatre? Lots of interesting thoughts there. You may not be a theatre, but does your venue have a lecture theatre or education space that isn’t always in use, where you might offer lunchtime concerts or showcase local experts talking in the evening? If you have a cafe, do many people use it as a social meeting place, even if they’re not planning to visit the museum? Offering free wifi or coffee could make a difference. At Charleston, which I visited at the weekend (I have another marketing lesson to share from them later this week), we were invited to pay for our admission tickets by Gift Aid. This involved paying a few pence more, but entitled us to a free tea or coffee each in the cafe. Of course, when we went to the cafe, we ended up spending more on sandwiches and cake to accompany the free coffee, but still felt that we were getting value for money. Has your venue tried any of these ideas? How did they work out? I’ve got two more videos to share today, coming from very different museums who participated in Museums at Night. The Hovercraft Museum only opens on certain days throughout the year, but had received a lot of advance publicity – possibly thanks to their James Bond and Top Gear ice cream van hovercrafts. Warwick Jacobs also spoke up for their event when he was interviewed on Radio 4’s You and Yours Museums at Night special programme. Their full day and evening of activities was a tremendous success, and just watching this video makes me want to take a ride on a hover!